We’re cooking and enjoying a relaxed weekend afternoon in my apartment. “That looks comfy, but you do know you have a psychiatrist’s couch in your living room, right? … Is the doctor in,” he asks, giggling at me as I sprawl out on my chaise lounge (aka “fainting couch”). 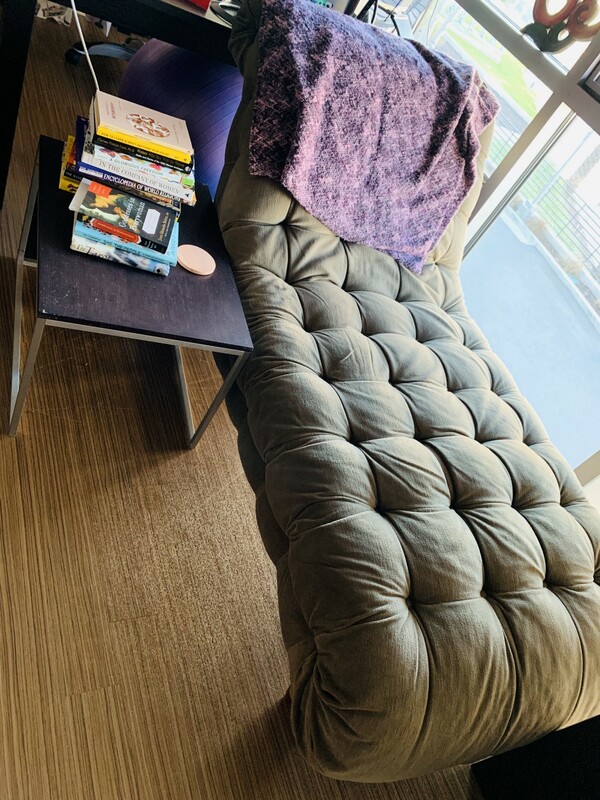 I love the floor-to-ceiling windows in this little nook, and I’ve had this chaise a long time. My inner theater person has always fancied the chaise lounge because it conjures images from Ancient Greek art (Gods and Goddesses reclining lasciviously) and the delightfully decadent Lily Langtree. The chaise itself may have originated in Egypt (Hello, Cleopatra). Romans used them during meals, for daytime reclining, and nighttime sleep. You can see one in nearly every Victorian play: Corseted women put a hand to their heads and exquisitely faint onto one when they became “over-excited,” usually following the attentions of a man. Or maybe the corsets were just laced a tad too tightly. I love my chaise and give it a place of honor wherever I’m living. But my friend’s question got me thinking about Lucy from the Peanuts Comic Strip and the sign on her famous psychiatrist booth: “The Doctor is in.” There Lucy sits, in her sidewalk stand, giving “expert” advice. I call my business Creative Maven, meaning my advice and services had better be “expert.” I stand firmly behind my 20 years of marketing and producing for clients and colleagues. I’m nothing like eight-year-old Lucy in her cardboard booth, but my friend made me wonder if my “psychiatrist’s couch” is always open, and well past business hours. · How many do you give? · Do you have a set limit per week/month? · When does a freebie become a real project? What is the time threshold? · Is there a topic of “never free” advice? · How do you choose who you say yes to? · How do you set boundaries around a quick chat? · How/When do you convert a friendly chat into a paid working or coaching session? I’m not exactly complaining, but when you consult for a living (my time and opinions = how I make money), that’s my currency. Many of my friends are also consultants or small business owners, and they all agreed this is a problem. So how does one bring value, be a good friend, and still set boundaries to have enough time to work and play? How and when do we turn that in/out sign around? Make a short list of your “immediates” and hit the pause button for everyone else. See what works itself out. Only allow one free idea per call/text/email and limit your interaction to the equivalent of a 15- or 30-minute TEDTalk at the most. Require (and stick to) an agenda for every meeting. Enforce downtime. Put your phone in airplane mode so you can’t be distracted, and only do business during set business hours. When people don’t want to take NO for an answer, being tactful just won’t work. If you make an excuse, the other party is going to find a way to solve it. There are only two unanswerable/non-negotiables: I can’t (and even that’s not 100%) and I don’t want to. We’re conditioned not to hurt people’s feelings (especially clients and potential clients), but if you really need to stop the back and forth, you have to be honest and say you don’t want to. This subject is well discussed, including in this great Forbes article by Kevin Kruse, who wrote 15 Secrets Successful People Know About Time Management. Lots of options: FindTime, Calend.ly and ScheduleOnce. Offer more than one time and date and make them pick. Last Monday I spent nearly seven hours on the phone — a combination of regular conference call meetings, random conversations, and a call to my Mom. During that time I received 11 LinkedIn requests for “let’s chat” (I only knew one of the 11 people), two Facebook messages, and a few WhatsApp notifications. I write this to remind myself to set my boundaries and give other people’s time the respect I want for my own. Which means I own a chaise lounge, not a psychiatrist’s couch. And is my best spot for meditating, reading, or gazing at the stars, getting all airplane-mode cozy under a nice blanket. It also serves for me as a nice visual reminder that if you don’t manage time, it sure as heck will manage you. Time and health are the two things we never get back, so decide for yourself when the doctor is OUT, and respect when others have that sign up too. If you like this share it with your friends, spark a conversation and hold that clap button down — hard. Heather is a marketer, writer, playwright, Microsoft MVP and lover of culture and “the why.” She has worked for over 20 years in technology and the arts. Heather lives in Los Angeles, California and enjoys traveling the world speaking about Office 365, SharePoint and Diversity, Inclusion, and Belonging. She is a published playwright, was born and raised in Michigan, Indiana, and Illinois, is a graduate of the University of Washington School of Drama, Seattle WA and did a semester abroad at Trinity College, Dublin, Ireland. Heather is always looking for an excuse to go to New York, New Orleans, London, Brooklyn and the list of cities she made in her Dad’s Time/Life map when she was 11. Check out her IG Story for #TheCurlerReport, tales of a woman on the go who happens to love her hot rollers.